See a SLIDESHOW of swimming hole photos in these states. Short hike down rough road into canyon with intermittent spring swimming hole and hot springs. From Tucson, go south on I-19 and get off at Exit 48. Take Warnaca Rd. east a very short way then go south on the East Frontage Rd. (along I-19). Go a short way to Aamado and turn east (left) on Amado-Mantosa Rd. Where this road ends, turn right on Amado Rd. then turn east (left) again on Forest Rd 184 (Elephant Head Rd.?) cross train tracks and continue on this road then onto Mt. Hopkins Rd. east heading toward the Smithsonian Institution Whipple Observatory. Before you reach the visitors center at the bottom of Mount Hopkins, see a rough, dirt road to the left (FR 183). Either drive down (if your vehicle can do so) or park and walk about a quarter mile down into the canyon across the stream to Agua Caliente Hot Springs. In the creeks around Camp Verde, northeast of Phoenix, in the Coconino N. F., there are numerous swimming holes. See DIRECTIONS below for a few of these. Camping nearby at the Clear Creek and Beaver Creek campgrounds. From Phoenix, take I-17 north to Exit 287 (RT 260) near Camp Verde. Directions below are given from this interchange. 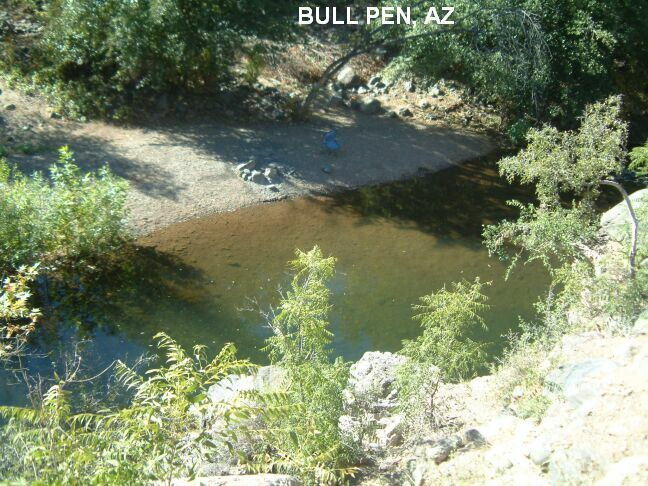 BULL PEN [BULL]: Short hike to a deep swimming hole in West Clear Creek. PHOTO . To get here from the interchange above, go east on RT 260, bypassing Camp Verde, then a few more miles to FR 618 on the left. Go about 2 miles north on FR 618 then turn east (right) on FR 215 and go about 3 miles to a gate that is locked. Park and hike about .5 miles to West Clear Creek where you will see the swimming hole. There is said to be another swimming hole upstream from here about 1.5 miles more. LAT, LON :lat=34.5397, lon=-111.6960(source: measured) (accuracy:exact). LINK TO GOOGLE MAP. Very confident. Verified 10/07. Updated 10/17/2007. 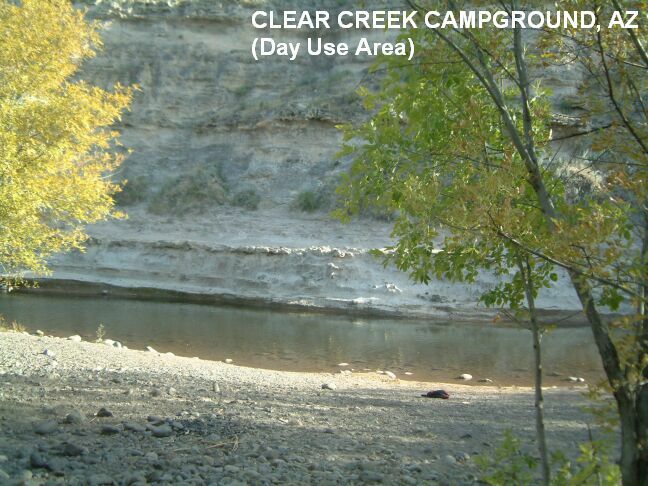 CLEAR CREEK CAMPGROUND [CLEA]: Nice Forest Service campground with a swimming hole in West Clear Creek. PHOTO . To get here, continue east on RT 260 past the turnoff for FR 618 (above) a short way to a sign for Clear Creek Campground. Go toward the campground and follow signs to the Day Use Area. 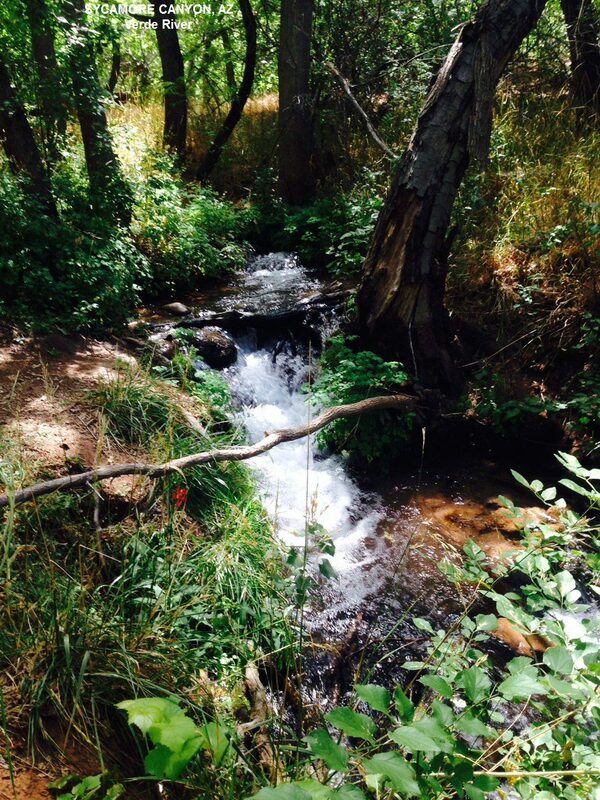 Park (pay fee) and follow a short trail down to the creek (you will have to cross an irrigation ditch on the way). LAT, LON :lat=34.5134, lon=-111.7640 (source: measured) (accuracy:exact). LINK TO GOOGLE MAP. Very confident. Verified 10/07. Updated 10/17/2007. WET BEAVER CREEK [WETB]: Hike about 7 miles round trip on the popular and scenic Bell Trail to several swimming holes in Wet Beaver Creek. YOUTUBE , YOUTUBE To get here from I-17 exit 287, continue north on I-17 to exit 298 at RT 179. Take RT 179 east a short way toward Beaver Creek Campground. Follow signs to the Visitor Center but park in the lot just before the visitor center for the Wet Beaver Creek trailhead. Follow this well-developed trail across the desert landscape (sunscreen recommended) and into the canyon to the Bell Crossing where the trail crosses Wet Beaver Creek - about 3.3 miles total. The first swimming holes is just upstream of Bell Crossing, a huge one called "The Crack". There are said to be more swimming holes upstream of here within 1.25 miles of the crossing. LAT, LON :lat=34.6741, lon=-111.6592(source: topozone) (accuracy:exact). LINK TO GOOGLE MAP. Very confident. Verified 10/07. Updated 10/17/2007. 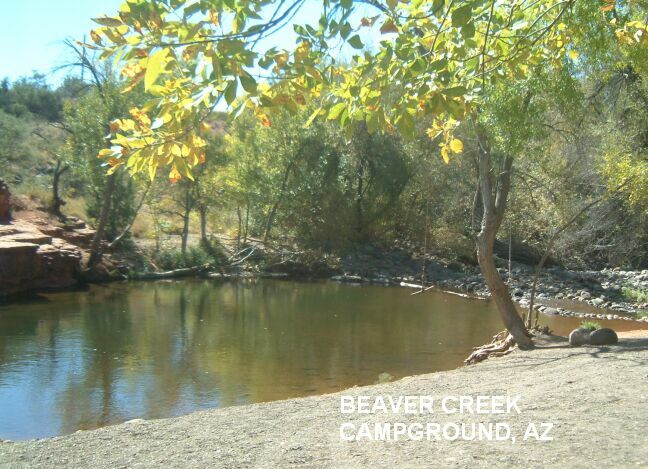 BEAVER CREEK CAMPGROUND [BEAC]: Very inviting, large and deep swimming hole at the Beaver Creek Day Use Area. Rope swings (watch for shallow water here) and picturesque red rock bluffs on the far side. PHOTO 1 , PHOTO 2 . To get here, continue past the Wet Beaver Visitor Center (above) and park at Day Use Area. Walk across the road and follow the sign to the creek side trail. The swimming hole is just a short walk down this trail. LAT, LON :lat=34.6691, lon=-111.7123(source: DeLorme) (accuracy:exact) LINK TO GOOGLE MAP. Very confident. Verified 10/07. Updated 10/17/2007. All directions are from Tucson. See below for details. FROG HOLLOW [FROG]: Hike about 8.5 miles round trip to a cool swimming hole in the Catalina Mountains east of Tucson. YOUTUBE , YOUTUBE . To get here from Tucson, head east on Tanque Verde Rd. for about 13 miles then continue east on Reddington Rd for about 10 miles (you enter the Coronado N. F. and the Catalina Mountains). You will be near the Chiva Falls trailhead on Reddington Rd. LAT, LON (TRAILHEAD) :lat=32.306265, lon=-110.574253(source: map) (accuracy:approximate). LINK TO GOOGLE MAP. Hike about 4.5 miles down (south) on this trail to the swimming hole at LAT, LON (FROG HOLLOW - SWIM):lat=32.271292, lon=-110.592964(source: map) (accuracy:approximate). LINK TO GOOGLE MAP. Pretty confident. Not verified. Updated 12/2012. Three mile (one way) desert hike above a creek along a saguaro- lined hillside to a deep, compact pool enclosed by several large rocks in the shade of small trees. In the Seven Springs Recreation Area of the Tonto National Forest. To get there, take I-17 north from Phoenix to Exit 223. Follow the Carefree Highway east to Cave Creek Rd. north. DO NOT turn off at signs to the "Cave Creek Recreation Area", which is a local park near here. (Make sure you get drinking water as there is none further up.) Stay on Cave Creek Rd. for many miles, through the towns of Cave Creek and Carefree, past numerous subdivisions, to the sign for the Cave Creek Ranger District office. STOP AT THIS RANGER STATION FOR MAPS AND INFORMATION. Continue up Cave Creek Rd. as it changes to FR 24, a dirt road which has some wash boarding but negotiable with a passenger car. About 9 miles past the ranger station you will see the Seven Springs picnic area. Park here and hike. Hike from the Seven Springs picnic area. A network of five trails originates in this area; the one along Cave Creek to the swimming hole is known prosaically as "Trail Number 4". 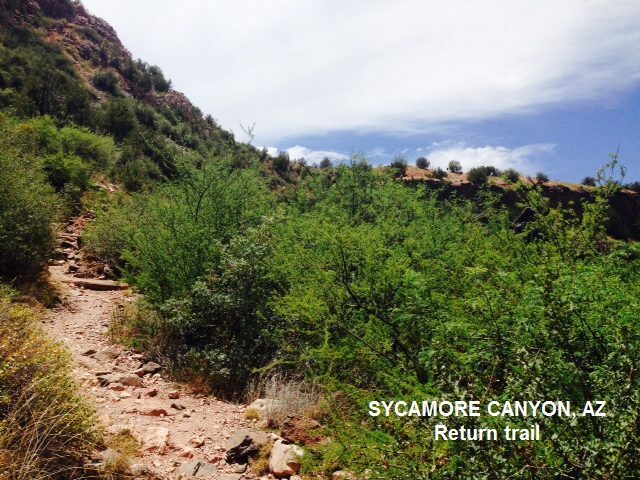 (SEE THE TRAIL MAP YOU PICKED UP AT THE RANGER STATION) The trailhead for #4 is just a short walk up Cave Creek Road (FR 24) from the campground, on your left after you splash through the creek on a low water bridge. The trail descends and heads west, closely following Cave Creek. It meanders initially through fragrant juniper stands, then up onto the canyon slope high above the water. Stop and enjoy the view: Saguaro cactus standing sentinel over clumpy prickly pear all the way down the canyon. As you cross through the creek the second time, about 3 miles in, the swimming hole is just downstream behind some rocks. There are said to be other swimming holes along this trail as it continues beyond this point for a total length of 9.9 miles, eventually coming our on another forest road (FR 1533 and FR 48). Picnicking, camping, swimming and canoeing on a beautiful clear stream and/or lake through rock canyon just outside of Winslow at/near McHood Park. If you bring a canoe, you can paddle through this beautiful canyon too. Camping at site - no hook ups - may be free camping. From Winslow, take RT 87 south a short way then RT 99 east (left turn) about 4 miles to McHood Park. Also, if you go a mile or two upstream, there are great jumping places into deep, clear water. 1. North Canyon River Mile 20: Hike one mile up-canyon, scrambling over boulders, to reach a stream where pools are carved into the slickrock. During times of plentiful precipitation, the stream transforms into water slides dropping into plunge pools. 2. Elves Chasm River Mile 116.5: It�s a quick half-mile scramble to reach this fairy-tale like paradise. Waters from Royal Arch Creek pour over a cliff, creating a waterfall and fern-decked grotto. Climb up on the rocks and jump into the deep, green pool. 3. Deer Creek Falls River Mile 136: From Deer Creek Falls that cascade just off the Colorado River, hike for 1.5 miles up-canyon through the curving Deer Creek narrows. You will find a stream shaded by cottonwood trees and canyon walls that contain ancient petroglyphs. Here at Deer Creek Spring is a second waterfall and an excellent swimming spot. 4. Beaver Falls River Mile 157: From the river, hike up narrow Havasu Canyon to reach a set of waterfalls that look more like a scene in Hawaii than a desert canyon. The blue green waters of Havasu Creek cascade hundreds of feet over travertine formations and land in deep pools that are nothing short of paradise for hikers on hot summer afternoons. These falls are located on the Havasupai reservation and sacred to the tribe. Beaver Falls is 4 miles from the river. From Flagstaff, go west on I-40 to exit 149 then west on RT 66. At Nelson, turn north on RT 18 and go 64 miles to Hualapai Hilltop, where the road ends. From here, hike about 8 miles (4 hours) to Supai on the Havasupai Indian Reservation. Havasu Falls and Mooney Falls, both of which have spectacular blue-green swimming holes at the bottom, at within hiking distance of here. A couple of swimming places at Mormons Crossing of Oak Creek south of the Sedona area near Cornville. One has rope swing, the other is more of a rapids. No camping at site. Campgrounds north of Sedona in Oak Creek Canyon. From Sedona, take RT 89A southwest about 11 miles then turn southeast (left) onto N Page Springs Rd. Stay on Page Springs Rd. for about 6 miles then turn right onto E Purple Sage Rd then turn left to stay on E Purple Sage Rd.. Go about .75 miles then turn north (right) onto E Willow Point Rd. Keep right to stay on E Willow Point Rd. (becomes gravel) and continue until you cross a bridge over Oak Creek. Cross the bridge then turn left and go a short way to a parking area. Trails begin near here and go down to the river. They take you to a deep pool with a rope swing and another place with rapids and a slick rock slide to play in. No more detailed directions. A very beautiful (but definitely discovered!) canyon along Oak Creek just north of Sedona, AZ on RT 89A through the Kaibab N.F.. Folks come in by the busload so don't expect solitude; take a hike up a side canyon from Oak Creek Canyon just a bit and you'll leave the crowds behind quick enough. There are several informal swimming holes in Oak Creek along RT 89A, look for cars parked on a hot day. See DIRECTIONS below for some of the more popular places. Slide Rock State Park; Kaibab N.F. Everything at Slide Rock S.P. No camping at Slide Rock S.P.. There are several National Forest campgrounds along RT 89A in Oak Creek Canyon. These are well signed but fill up fast in good weather so get there early. GRASSHOPPER POINT [GRAS]: A report from a fan: "Grasshopper point is a wonderfully easy swimming hole to access and quite beautiful. Just follow the wide trail to the right of the parking area. A deep green pool invites the young at heart to jump off the twenty foot cliffs and the stream continues downward, providing tamer swimming areas for the rest of us! If you like solitude (the spot is often quite crowded on weekends) you can rock-hop down stream until you find a spot all to yourself. There are also some beautiful spots if you follow the trail that leads to the left of the parking lot. It meanders along the stream with no particular goal, except to enjoy the views. Wander off-trail toward the creek and find your very own piece of heaven! Restrooms/changing areas are available in the parking area. Go early if you go on a weekend, as the place fills up quickly. During the weekdays you can have the place almost all to yourself. SLIDE ROCK S. P. [SLID]: (NOTE: This location is sometimes closed to swimming because of water contamination - check on their web site before you go.) 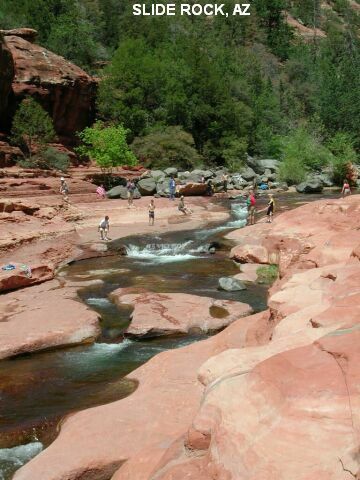 How could we have a western swimming hole site without Slide Rock in Oak Creek. PHOTO 1 , PHOTO 2 , PHOTO 3 , PHOTO 4 , YOUTUBE . The west just has to be bigger and better than the east, so they took our eastern Sliding Rock (see North Carolina) and plunked it down in about the prettiest western canyon you could hope to find. Just as in the east, kids some in by the busload so don't expect solitude; take a hike up a side canyon from Oak Creek Canyon just a bit and you'll leave the crowds behind quick enough. 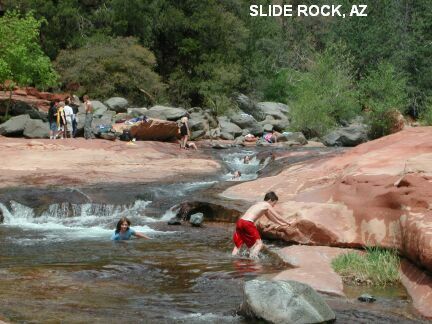 It is Slide Rock State Park now, so there will be fee and you'll have to keep that suit on! WEB SITE. LAT, LON : lat=34.94722, lon=-111.75333(source: web site) (accuracy: exact) LINK TO GOOGLE MAP. To get here take RT 89A north from Sedona, past Grasshopper Point (above) about 7 miles to the signs for Slide Rock S.P.. Very confident. Verified. Updated 12/7/2005. 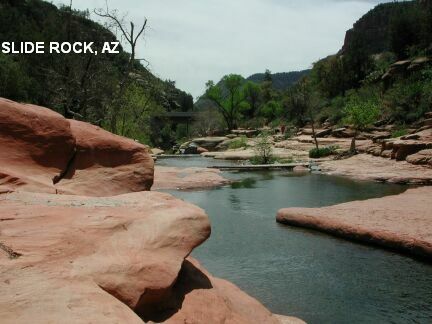 RED ROCK S. P. [REDR]: At the Crescent Moon Picnic Area, also known as Red Rock Crossing, you can view the spectacular Cathedral Rock and wade and swim in Oak Creek. There is a fee for parking here. LINK TO INFO AND PHOTOS . Can be crowded later in the day. To get here, continue on FR 216 (Upper Red Rock Loop Road). Follow the signs to Red Rock State Park. 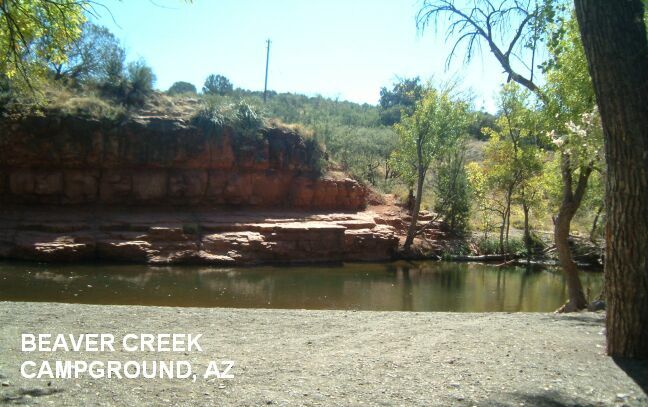 Park, pay fee, and hike along the creek to swimming holes. No better directions. LAT, LON : lat=34.81197, lon=-111.82812(source: web site) (accuracy: approximate) LINK TO GOOGLE MAP. Pretty confident. Not verified. Updated 12/2013. 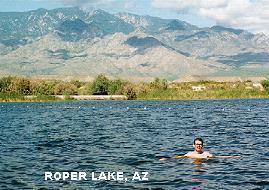 In the rivers around Payson, northeast of Phoenix, in the Tonto N. F., there are numerous fabulous swimming holes. See DIRECTIONS below for a few of these. Camping nearby at Ponderosa or Christopher Creek - both are Tonto N.F. campgrounds. Also at Childs Campground (see Verde Hot Springs below). From Phoenix, take RT 87 northeast to Payson. All directions below are given from Payson. 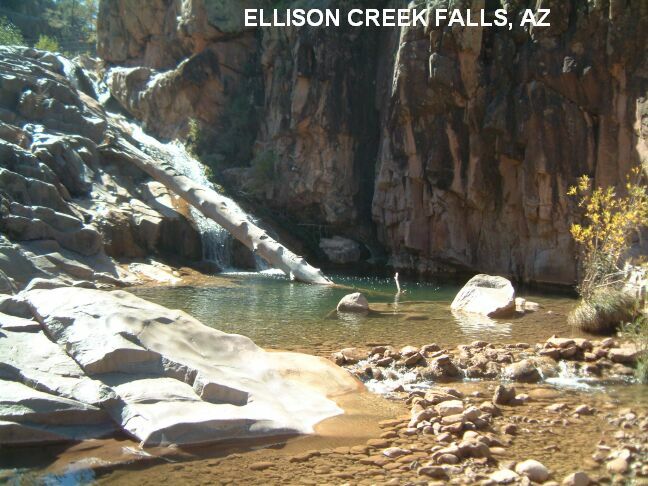 ELLISON CREEK FALLS [ELLI]: Very scenic spot, swimming holes at the falls and below, surrounded by rock slabs. PHOTO 1 , PHOTO 2 , YOUTUBE . To get here: From Payson take RT 87 northwest about 2 miles then RT 199 (Houston Mesa Rd.) north. Go about 7.5 miles, cross the creek twice, then turn right on a dirt road and park as you come to a locked gate. Walk down the road past the gate about .4 miles where you will go downhill and across a dry wash. Just past this dry wash, take a trail off to the right down to the creek then walk upstream on the rocks to the falls. There is a swimming hole at the bottom of the falls as well as downstream. LAT, LON :lat=34.3511, lon=-111.2766(source: measured) (accuracy:approximate). LINK TO GOOGLE MAP. Very confident. Verified 10/07. Updated 10/17/2007. There may be swimming holes in the Verde River very near here too. To find them, when you came up Houston Mesa Rd, you will have passed the Water Wheel Campground. If you park there and hike east along the river there are several swimming holes. One is just about .25 mile from the road at the bottom of a narrow gorge (Water Wheel Falls). There are others farther up. (Apparently, if you continue up this trail, you will also come to Ellison Creek Falls, above. So this is another way to get there.) LAT, LON: (OF THE CAMPGROUND) lat=34.352, lon=-111.286 (source: map) (accuracy:approximate). LINK TO GOOGLE MAP. Uncertain. Not verified. Updated 12/2012. CHRISTOPHER CREEK [CHRI]: Fairly short hike from Christopher Creek campground into Christopher Creek Canyon. Just south of the Mogollon Rim. Lots of swimming holes and waterfalls in Christopher Creek. Here is a video of a smaller one YOUTUBE . You can camp at the campground or just park in the day use area (pay fee!). You can walk from here into the canyon - not sure about hiking directions - ask at the campground. One trailhead seems to be here: If you walk west from the campground about 1 mile on the shoulder of RT 260 there is a trailhead on the south side of RT 260 (go to the right of the Boy Scout Camp and through the fence) that you can hike about 1 mile or less into the canyon. (There may be no parking signs on RT 260, so walk from the day use area at the campground). Here is a map of this hike . There are other hikes and the swimming holes as well. Opportunities for canyoneering and rappelling but not required. To get here: From Payson take RT 260 east LAT, LON (CHRISTOPHER CREEK CAMPGROUND):lat=34.308, lon=-111.035(source: map) (accuracy:approximate). LINK TO GOOGLE MAP. Very uncertain (of hiking directions). Not verified. Updated 12/2012. HELLS GATE [HELL]: It's a long, hot, steep and strenuous 13 mile roundtrip hike (better plan an overnight backpack) down to Hell's Gate in the Hells Gate Wilderness in the Tonto N. F.. Trail Description . Take plenty of water. The hike out is very steep uphill. Hells Gate is said to be well worth the effort if you are a backpacker. 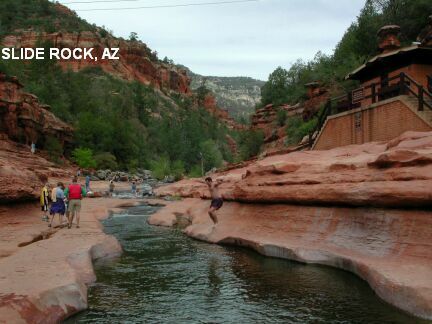 Rock-walled canyons with stream-side vegetation in the desert and swimming holes to enjoy. Some nice level places to camp too. To get here from Payson, go east on RT 260 for 11 miles to Little Green Valley. Turn south (right) on FR 405A and drive 1/2 mile south to trailhead LAT, LON (TRAILHEAD): lat=34.27988, lon=-111.13405(source: web site) (accuracy:approximate). LINK TO GOOGLE MAP. The trailhead is marked and easily accessible by car. The hike: Pass through the gate and hike along the old road. The road climbs steeply over a ridge and then follows a fence line. Stay on the road, do not go through any of the gates on the fence. After 1 mile the road forks -- take the left one and follow along the creek. The trail crosses the creek about 7 times. After 2 miles the trail comes to a corral. From the corral the trail turns right and climbs a very steep hill to the ridge line. There is a fork on top of the ridge; take the left one and continue on the trail as it descends and climbs several small mountains to the top of Hellsgate Ridge, where it enters the wilderness (4 miles). The trail in this section is sometimes a trail and sometimes and old jeep road. The two criss-cross each other several times. So if you miss the trail the road will get you to the same place but it was usually steeper. From the wilderness boundary the trail descends for the next 2.5 miles. After 1.5 miles you will come to a large stock tank. The trail gets a bit vague once you reach the creek, but a trail continues on the other side, going west a couple of hundred yards to where Haigler Creek joins Tonto Creek. The banks are rather brushy, but there are a handful of good camping spots near the confluence and the verdant areas along the creeks are inviting places. LAT, LON (SWIM HOLE): lat=-34.21606,-111.09615, lon=-111.13405(source: web site) (accuracy:approximate). LINK TO GOOGLE MAP. Pretty confident. Not verified. Updated 12/2012. 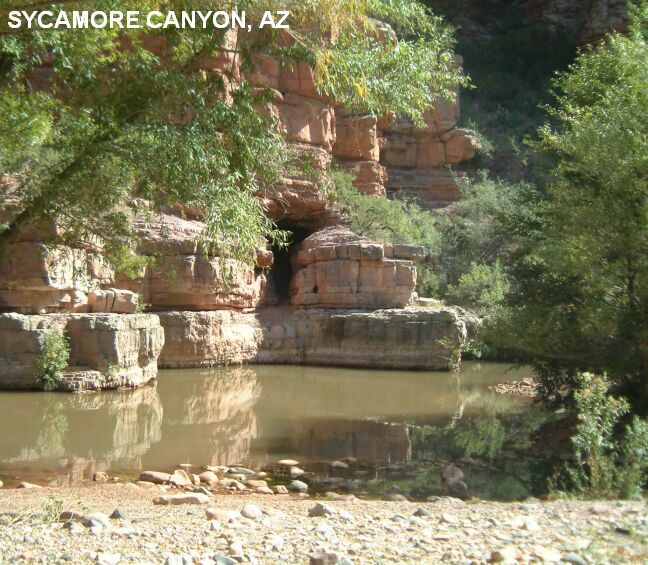 HAIGLER CANYON [HAIG]: Campground in Tonto N. F. with several swimming holes around the campground and in nearby canyons. No further information. To get here from Payson take RT 260 east about 24 miles then turn east (right) onto East Colcord Rd. (FR 291). 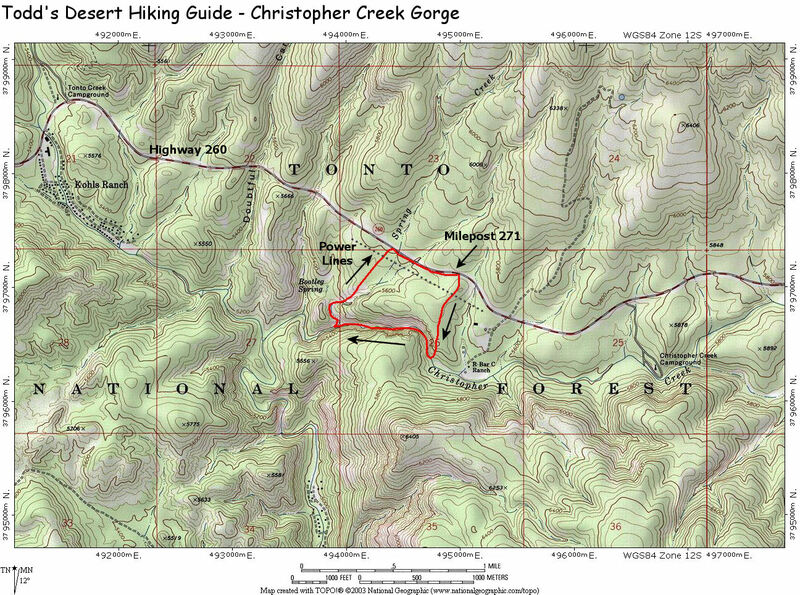 Go about 4 miles then turn south (right) onto Chamberlain Trail (FR 200) and go about 7 miles to the Haigler Canyon Campground (Dirt roads may be difficult after rain. Roads winding with drop offs.). The swimming holes are near here. LAT, LON: lat=34.2194849, lon=-110.96290(source: web site) (accuracy:approximate). LINK TO GOOGLE MAP. Pretty confident. Not verified. Updated 12/2012. TONTO NATURAL BRIDGE S. P. [TONT]: Swimming place in Pine Creek in State Park. Swimming is not allowed under the Natural Bridge. People do swim downstream in Pine Creek. No lifeguard - swimming is at your own risk. STATE PARK WEB SITE check to be sure it is open before you go. There is an entrance fee. To get here: From Payson head north on RT 87 for about 2.5 miles then, at the traffic circle, take the 2nd exit onto RT 260 W/RT 87 N. Go about 8.6 miles then turn west (left) at FR 583 and continue a short way to the state park. LAT, LON :lat=34.3207, lon=-111.4565(source: DeLorme) (accuracy:approximate). LINK TO GOOGLE MAP. Very confident. Not verified. Updated 11/09. FOSSIL CREEK [FOSS]: Several great swimming holes in Fossil Creek - Fossil Springs, Fossil Falls (see note below) and others. YOUTUBE , YOUTUBE , YOUTUBE . NOTE: The road (FR 708) from Strawberry is closed until April 15, 2015. The below directions cannot be used until then. There is another way to get here in the meantime but it is very difficult and is not described here. To get here: From Payson take RT 87 northwest to Strawberry. In Strawberry, take Fossil Creek Rd. (FR 708) (may be rough dirt, High clearance, 4 wheel drive vehicle may be required - ask at the Forest Service office in Camp Verde about the condition of these roads. ) to the west about 5 miles. Turn right on (unknown name) Rd. Park at the trailhead for trail #18 and hike about 3 miles to Fossil Creek. Fossil Creek Rd. turns to dirt then go PAST the first turn off to the first Fossil Springs trailhead - keep driving down the side of the canyon into the canyon. There are a couple of tight switchbacks, then , after the second one, there is a small parking area on the right. Park and hike back up the road you came down to the rock with the purple X and follow this trail to the waterfalls. Keep close to the water and there are many swimming holes along the way. Or, walk downstream a short distance to Fossil Springs, then a bit further downstream to Fossil Dam. We received this note about the dam: "I can give you some good info that in 2005 the Fossil Creek Hydro Dam was being decommission and that part of the stream was posted off limits, I think by the BLM during the decommission. The flume was empty also so it looks like no more flume rides. I never had the nerve to go through the enclosed pipe portion since I was not there with a local who would have rode it first. 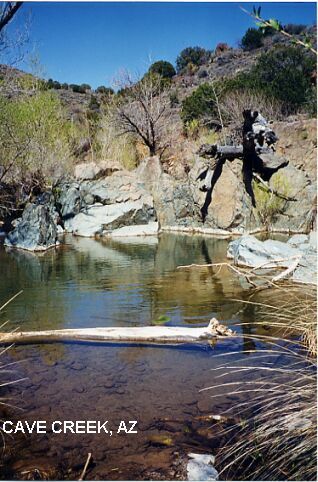 At the end of Fossil Creek is a primitive BLM camp area on the Verde River." Don't know current status of the dam swimming place, may be gone. LAT, LON (of falls) :lat=34.415, lon=-111.605(source: measured by another) (accuracy:approximate). LINK TO GOOGLE MAP. Pretty confident. Not verified. Updated 12/2013. 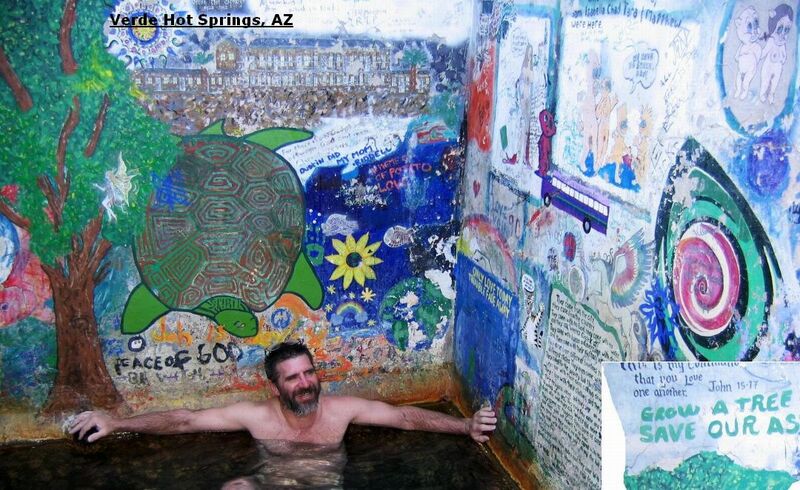 VERDE HOT SPRINGS [VERD]: NOTE: We received this puzzling and worrisome news from along-time visitor in 1/2014: "Using our thermometer, the outdoor pool registered only 80-83F degrees, a pool usually temping in at 98F while the indoor pool was a mere 100F, and way down from the usually almost too hot 104F. And, we noticed the outdoor hot pocket areas around the feet were no longer flowing the usual �hot� we�ve known. As a result of the decline in the outdoor pool temperature, hot springs visitors were discouraged from its use as a warm shelter from the 40F air temps and that reaction caused the indoor pool to be constantly packed with people trying to be warm. And, going from the hot indoor pool to cool off in the cooler outdoor pool was out�going from fairly hot to cold is no good." Please tell us if you go there and find that the temperatures have returned to their old levels. Used to be an old hot springs resort but all that remains are several concrete pools in a beautiful desert setting in a canyon on the west bank of the Verde River. PHOTO , PHOTO , LINK TO PHOTO . Being right next to the river, you can also jump in to cool off. The jump, approximately 20 feet, from the sheer ledge of the hot spring concrete area, is into the cold Verde River. (When you jump after being in the 102 degrees springs into the 40-50 degree river and climb back into the springs, there is a sensation of ice cubes being next to your body. Cool!). 1.5 mile hike each way. High clearance, 4 wheel drive vehicle may be required - ask at the Forest Service office in Camp Verde about the condition of the roads mentioned below. No fee. Clothing optional - and PLEASE carry out all trash! To get here from Fossil Creek Rd. (above), continue on Fossil Creek Rd. (FR 708) then onto Childs Powerplant Rd. (FR 502)(High clearance, 4 wheel drive vehicle may be required - ask at the Forest Service office in Camp Verde about the condition of the roads mentioned here.) Continue to the Childs Campground (Forest Service, primitive, vault toilets) In total, from Strawberry, it is about 23 miles of rough road to get to the campground. Park at the campground and hike upstream (from the north end of campground) along the Verde River, fording the river several times (BE CAREFUL OF CURRENTS) for about 1.5 miles. The Verde Hot Springs are on the opposite side of the river from the campground. LAT, LON :lat=34.355, lon=-111.709(source: Topozone) (accuracy: exact). LINK TO GOOGLE MAP. Pretty confident. Not verified. Updated 1/14/2003. Tubing, swimming and picnicking at a National Forest picnic area on the Salt River. National Forest Web Site Info. Camping at 2 N.F. campgrounds just west of here off N. Bush Hwy. From Mesa, travel 7 miles east on the Superstition Freeway (US 60) to Power Road /Bush Highway/Forest Road (FR) 204 and turn north. Follow Bush Highway for 13 miles to FR 169, and turn left. Follow FR 169 for 1 mile to the site. The entire route is paved. The poor man's Palm Springs! 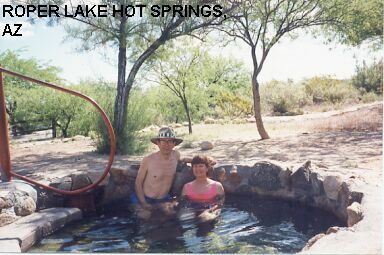 At Roper Lake S.P., for a $10.00 fee (1998), you can camp, hike desert trails, swim in a cool, clear lake with a mountain view and then warm up in a compact man-made rock hot tub fed constantly with natural, non-sulphurous, hot water. There is even a wildlife refuge on the grounds, with a spring-fed fountain and snakes and critters galore. Camping at site, covered tables, hook-ups, lots of RVs. No reservations. 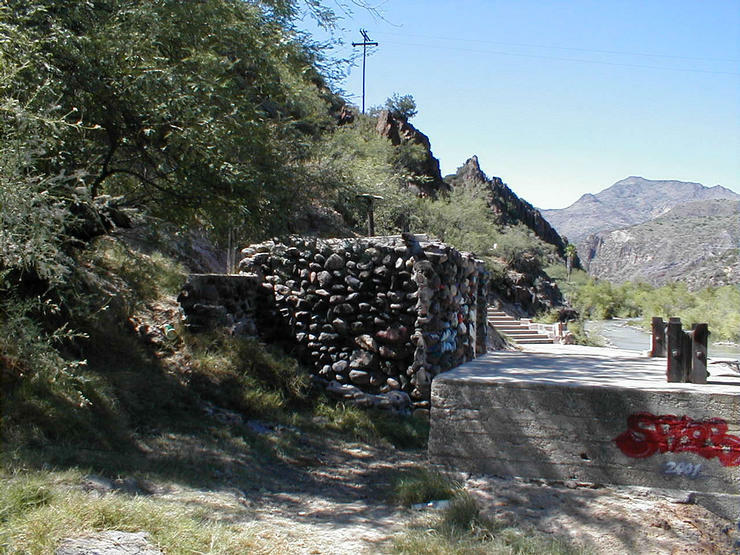 From I-10 exit 352, take RT 191 north toward Safford, look for signs to Roper Lake S.P..
A very pleasant 3.5 mile round trip hike down into a canyon and along a perennial stream to several swimming holes. Camping nearby at Dead Horse Ranch S.P. or near Jerome at Potato Patch N.F. campground. From Phoenix, take I-17 north to Exit 287 (RT 260) near Camp Verde. Go west on RT 260 then turn left at RT 89a then continue straight onto N. Main St. through Cottonwood. Past Cottonwood, follow the signs toward Tuzigoot National Monument (well worth a visit) - you will turn right and, after you cross the Verde River bridge, turn left on Sycamore Canyon Rd.. Go about 11 miles down this dirt road (along the Verde River), which is rough at places and seems to require a high clearance vehicle except there was a Toyota Camry up there upon a visit in 2007. In any case, it is slow going in parts and may be difficult in a sedan. Park at the end of the road where the Sycamore Canyon trailhead sign is. Hike down this trail, steeply down at first then upstream along the creek. After about 1.4 miles from the trailhead, you will come to a large rock cairn (rocks in a wire basket) which marks Summers Spring - here you cross the stream and resume the trail on the other side at another rock cairn. Continue .3 miles more and you will cross the stream again and come to a large pool - this is the first swimming hole. There is said to be another swimming hole upstream at Parsons Spring. A short hike to a waterfall and swimming holes in creek. Best in spring or after a rain, may be pretty dry in late summer. Vault toilets at Lower Wolf Creek campground. Camping nearby at Lower Wolf Creek campground. May be optional at downstream swimming holes. From Prescott, take the Senator Highway about 5 miles (past the YMCA camp) and, after the road turns to dirt, go right at the sign for Upper and Lower Wolf Creek. Go past Lower Wolf Creek campground and after the first curve in the road the trailhead is on your left and is signed Wolf Creek Loop Trail 384. Park off the road. Wear long pants and hiking shoes. Hike downhill (somewhat steep - loose gravel and slippery rocks may present a hazard). Keep right to hike along Wolf Creek where you may have to bushwhack a bit through bushes and branches. It is about .5 mile to the waterfall and further downstream, as Wolf Creek approaches the Hassayampa River, there are more swimming holes.